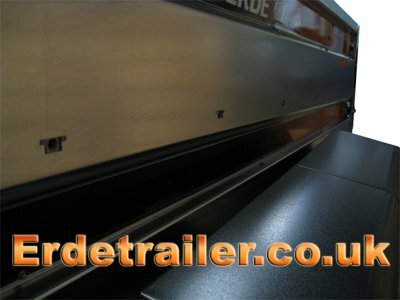 We find that some people have problems following the instructions Erde supply with their trailers. 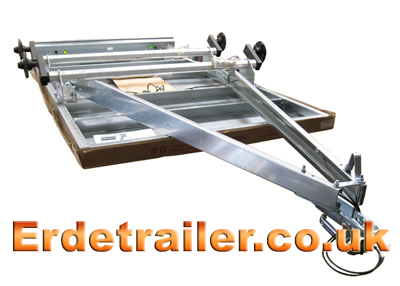 To make this easier we have put together our own illustrated instructions for assembling Erde trailers. Do not fully tighten any body panel bolts until all side panels and mudguards are correctly fitted. This is because you may need the extra slack in order to correctly position some parts later. Most nuts are captive nuts to speed up assembly. Click on a number to quickly jump to a step. 1. Start with the floor pan upside down, fit the side reinforcement bars and axles. 3. Attach the drawbar to the front axle. 4. 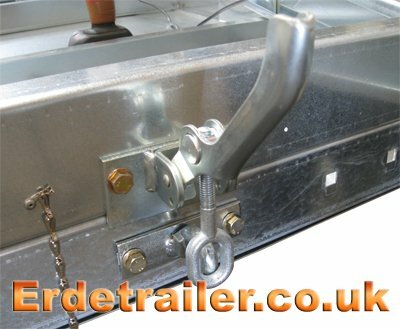 Attach the drawbar to the floor pan using the tipping bracket. 5. Fasten the light bar to the floor pan. 6. Attach the cables to the lights. 8. 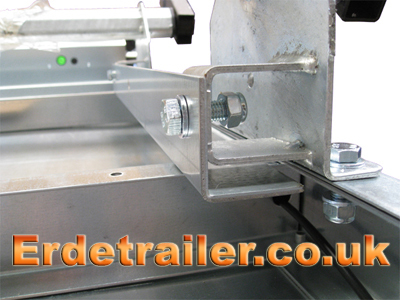 Tighten all bolts underneath the trailer. 9. Turn the trailer the correct way up. 10. Fit a side panel. 11. Fit the other side panel. 12. Fit the front panel. 16. Attach the ‘nudge’ bars. Please note: Due to vibration bolts can rattle loose, all bolts MUST be checked after 60 miles. It is also recommended to check lights, couplings, wheels, and wheel bearings BEFORE every long journey. 1. Start with the floor pan upside down. Fit the side reinforcement bars and axles. Before you can mount the axles you must check that the reinforcement bars are in place. These should already be in position, if not, they must be pushed into each side of the floor pan where the captive nuts in the reinforcement bars will line up with the bolt holes in the floor pan. These captive nuts will be used to fix the axles to the floor pan. Now you can fix the axles to the floor pan. 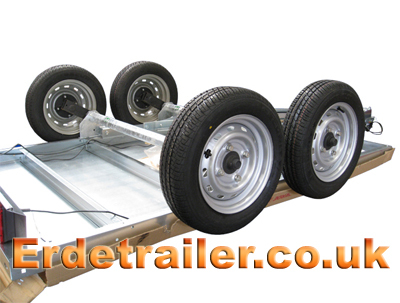 Be sure to tighten the axle bolts fully at this stage as the trailer will be too heavy to turn back over later. A spring washer should be used on each axle bolt to prevent them from vibrating loose. 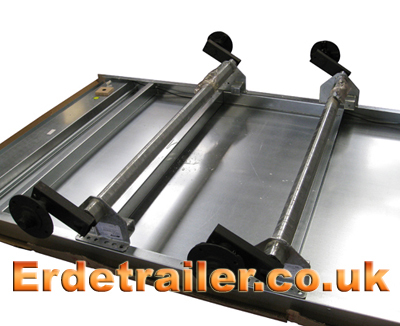 To add strength to the axles, a reinforcing plate must be bolted between the axles on either side of the trailer. This also provides a solid place to mount the drawbar. At the end of the drawbar, remove the large bolt that is only thumb tight where the coupling connects to the A-frame. This loose bolt keeps the A-frame drawbar folded together during shipping and will need removing before the drawbar can be opened up. Remember to thread the two coloured wires through the drawbar, leaving enough slack to reach the light bar. Now you will need to open up the drawbar. 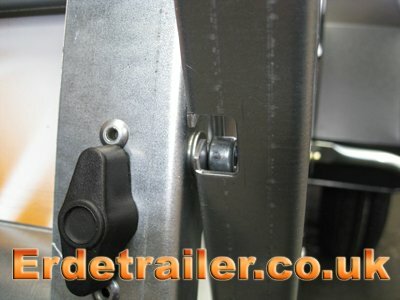 Connect one side of the drawbar to the axle before opening it so that you have something to pull against, this should make it easier. 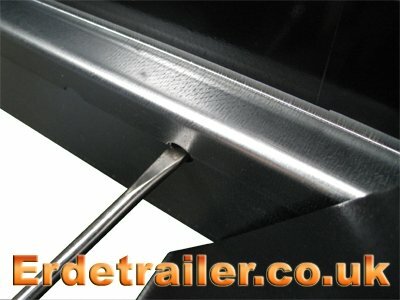 When the A-frame drawbar has been opened up, bolt the end you were pulling on to the opposite side of the axle. Replace the bolt that you removed from the coupling before opening up the drawbar. You will notice that this bolt now passes through both the coupling and drawbar, tighten this up to lock the A-frame in position. 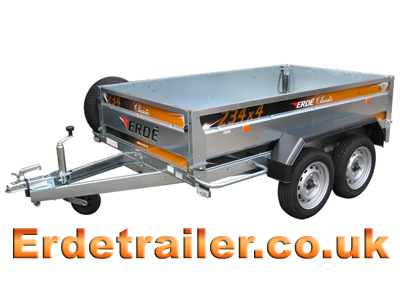 Due to the twin axle design of this trailer it does not have the tipping feature found on Erde’s smaller trailers, although it still uses the tipping bracket to firmly attach the drawbar to the floor pan. In order to attach the tipping bracket you will first have to fit the A-frame’s reinforcing crossbar. This is a small length of box section with angled edges that fits between the two main sections of the drawbar. 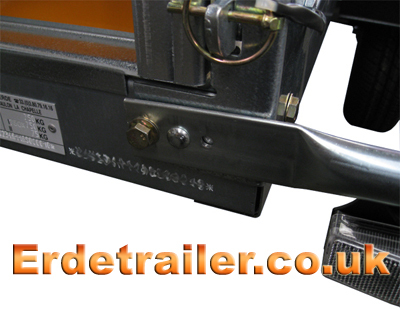 This gives the drawbar extra strength, as well as a place to mount a tipping bracket. The crossbar may need some persuasion in order to get it into the correct position. A rubber mallet is perfect for this as won’t mark the metal as you tap it into place. Once the captive nuts in the crossbar line up with the bolt holes in the drawbar it is in place and can be secured with bolts and spring washers. 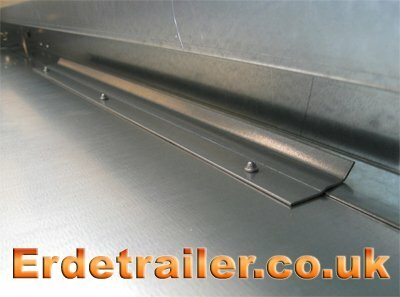 The tipping bracket must be fitted to the floor pan as shown below. There are pre-drilled holes on the front edge of the floor pan where the ‘hook’ shaped part of the bracket mounts. The adjustable latch comes pre-attached to the A-frame crossbar. Remember that in the image below the floor pan is upside down. 5. Fasten the rear light bar to the floor pan. The light bar is eventually secured by the body panels, but first you must slot it under this plate. 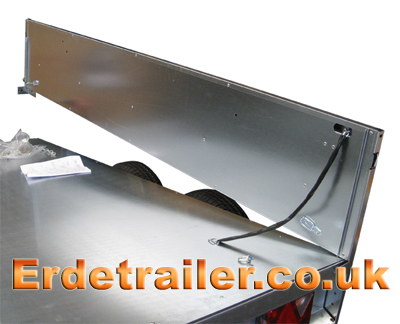 This will hold the light bar in place while you turn the trailer the correct way up to fit the body panels. Attach the colour coded cables to the corresponding sockets on the reverse of the rear light bar. Slot the cables into the sockets and then twist the coloured sheath clockwise to lock them in place. The plugs will only slot into the sockets in one direction, so line up the pins and don’t force it. Once connected, rout the cables neatly along the inside of the drawbar using the clips provided. 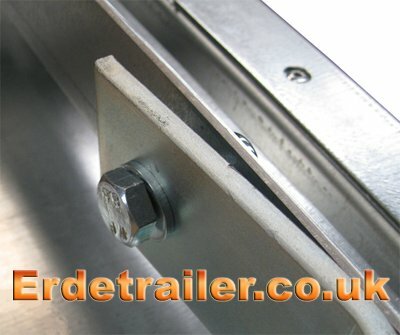 This model of trailer uses wheel studs as opposed to nuts. To tighten these studs evenly you should work your way around the wheel tightening opposite bolts until you arrive at the first one again. This is the best method of tightening any wheel nut or stud as it results in even tension around the rim. 8. 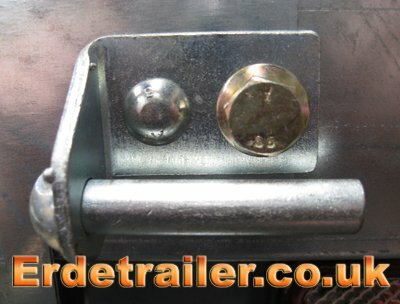 Tighten all bolts under the trailer. 9. Turn the trailer the correct way up. This will require at least two people. It is best to mount side panels at the back first, hooking the light bar with the rear of the panel. Now lower the front into position. When you get a side panel into the correct position insert a 13mm bolt into both ends of it and tighten them up with your fingers to hold it in place. 11. Fit the other side panel in the same way as before. When both side panels are in place there are two 10mm bolts that secure the light bar to the rear end of both side panels. It is important to remember these as they are so small they often get forgotten. 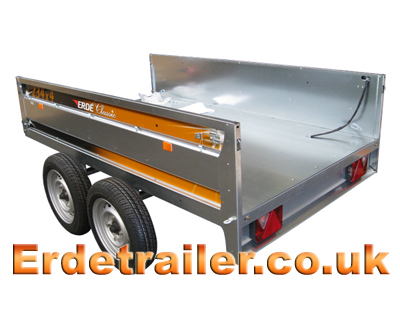 The front and rear panels on the 234×4 are hinged and removable, making the trailer more versatile. This does make them slightly trickier to fit. On each side of the front panel you will notice two small lugs. The lugs closest to the top of this panel slot into a cut out in the front edge of both side panels. This forms a basic hinge. See the example below. The lugs at the bottom of this panel slot into latches also at the front of each side panel. These latches can be quite stiff, so line the lugs up with the latches before firmly swinging the panel into place. These latches are then secured with lynch pins. 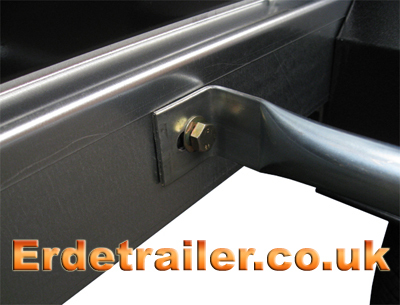 Before the tailgate can be fitted you must first attach hinges to the rear of you trailer. 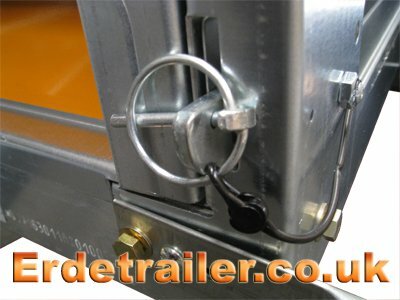 These hinges fasten to the trailer with a single bolt while small locating studs hold them in the correct position. Locating studs are useful when you begin to tighten the bolts securing the hinges because the hinge would naturally want to rotate with the bolt when under pressure. The mudguards mount onto pre-drilled holes in the sides of the floor pan and side panels. You can see the captive nuts along the side panels, simply line the mudguards up with these and bolt them on. A 13mm socket and extension is needed to reach these bolts. If you are having trouble with nuts and bolts not lining up, try using a screwdriver in the bolt hole to lever the panels into position. This is why bolts in the body panels should be left thumb tight until this stage. Start with the body panels and mud guards before double checking the axle, drawbar and tipping bracket. Make sure all bolts are tight and special attention has been paid to the axles and tipping bracket. 16. Fit the front ‘nudge’ bars. …and one on the front. While fitting the nudge bars you will notice the front marker lights attached to them. 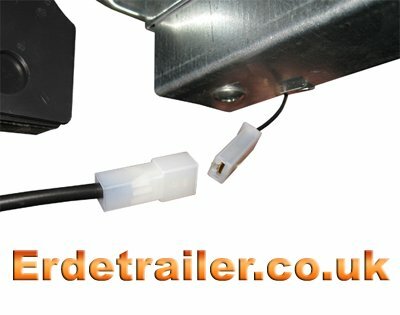 Once the bars are in place you will need to connect the marker lights to the trailers wiring loom. 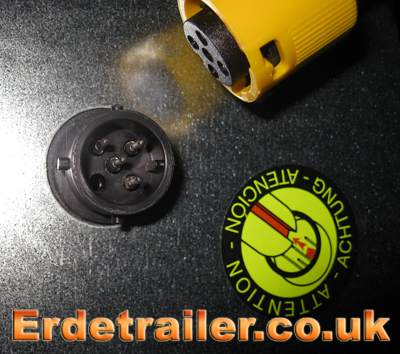 Under both front corners of the trailer you will see a small electrical plug, this is where you plug them in. Again, remember to perform a thorough check of all nuts, bolts, wheels, bearings and lights after the first 60 miles. 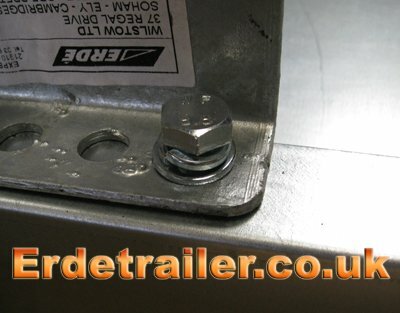 Vibrations can cause slackening of nuts and bolts in new trailers, so it is very important you perform this check.